We had spring break last week and to be honest it did not turn out as well as I hoped. But we did get to go hiking on the last day of spring break and that went really well. We are super blessed to live in a place that offers so many places to get outside and do stuff. 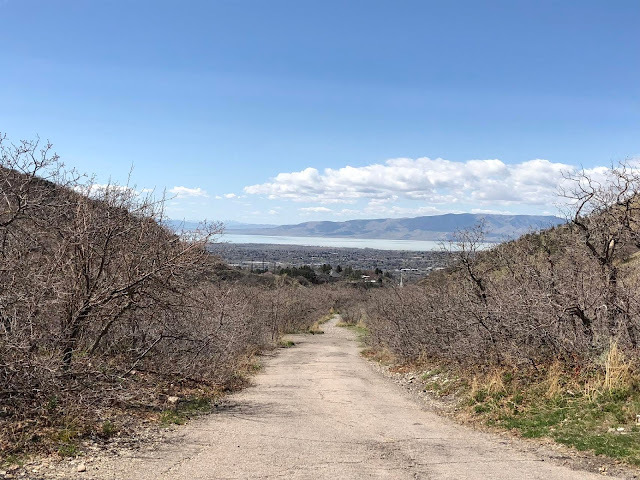 We have several hiking trailheads within a few miles and a whole ton of other trailheads and campgrounds within a few hours of us. So my sister, my mom, and I decided to take advantage of those options. 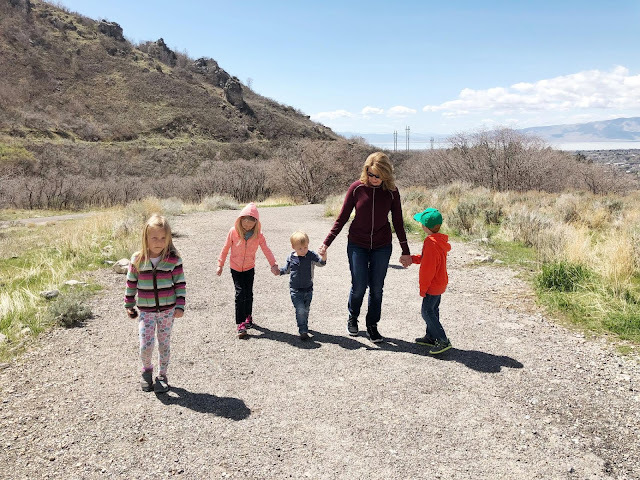 We decided to take the kids up to Rock Canyon and just let them hike as far as they wanted and then turn around and head back. V fell asleep in the car but woke up right after we parked. 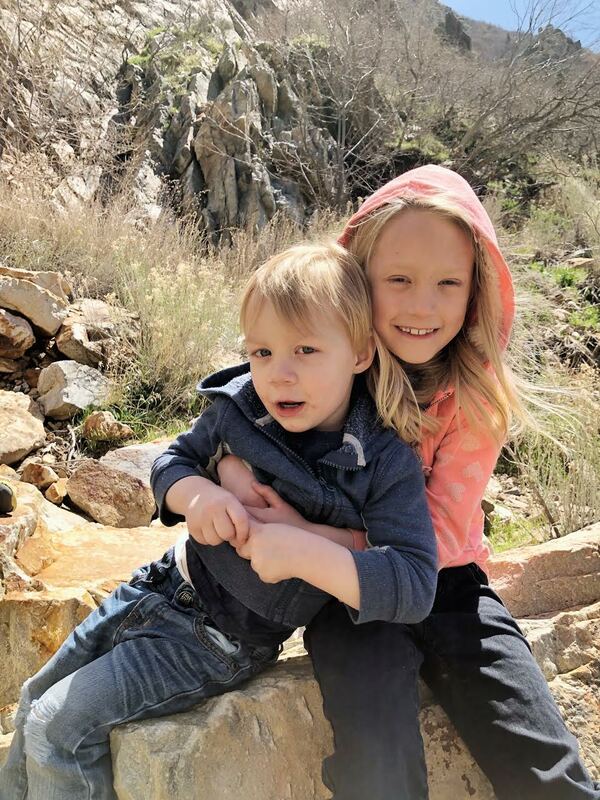 That turned out to be a good thing because a stroller won't make it very far on this hike. He walked about half of the way and I ended up carrying him the rest of the way. Mostly because he stopped every two steps to pick up a handful of rocks. 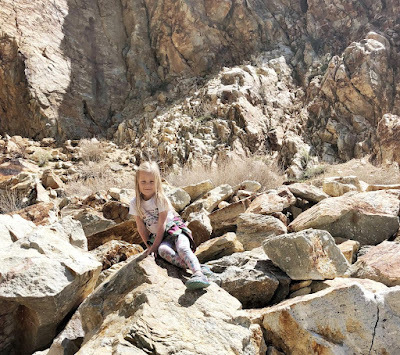 Rock Canyon is a fun trail to hike because there are a lot of little trails that split off of the main trail that make it fun to explore. There are also a lot of places to rock climb or to take pictures. It's not as pretty in the early springtime but in the fall, this is a beautiful backdrop for family pictures! I've taken so many of my family picture and my kid's pictures up there. Rock Canyon is also great because it's super easy to do what you have time for or what you want to do. The path is nice a wide so it doesn't ever feel crowded and you can turn around at any point. There are also a lot of places to take small breaks if needed. 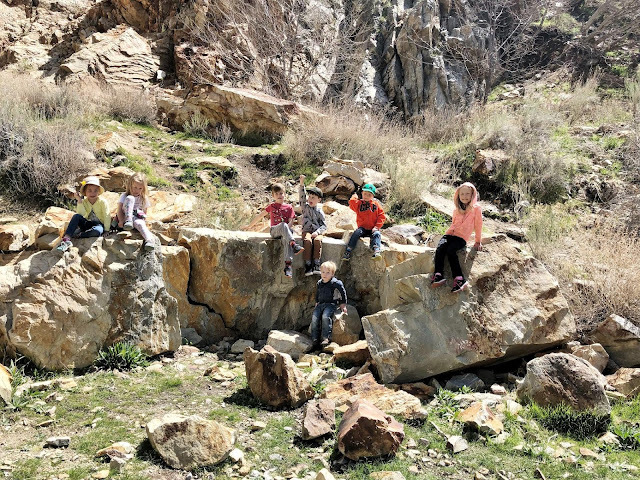 This is a great place to hike for families with little kids. I grew up going to Rock Canyon and playing around in the rocks and fields while my dad and uncles rock climbed. I loved it! We are also very blessed to live near to our family and that the kids have so many cousins to be friends with. After our hike, we took the kids to a nearby park, which you can actually follow one of the trails to, to have a snack and play for a little longer before heading home to make dinner and have the rest of our evening. Do you have a lot of hiking areas where you live? What did you do as a kid during spring/summer break?